Great design and ideal size make this a perfect water-resistant laptop backpack for women. What do you want from a backpack? Charging your phone while travelling is a boon. You also want a water-resistant backpack that will keep your computer (up to 17-inch size) safe from dampness. Also necessary is a place for your keys and headphone, book, magazine and a few clothes that won’t get damp if it rains. You want zips that won’t break. Compartments everywhere for keys, sunglasses, phone or a drink bottle. A decent padded strap that doesn’t feel like you are being strangled by a weak person all day long. A backpack for women needs to have safety in mind. For this, there is a meshed easy access area that sits against your back and keeps valuables out of sight and out of mind from would-be thieves. Another safety feature is the USB charging port on the outside of the backpack. 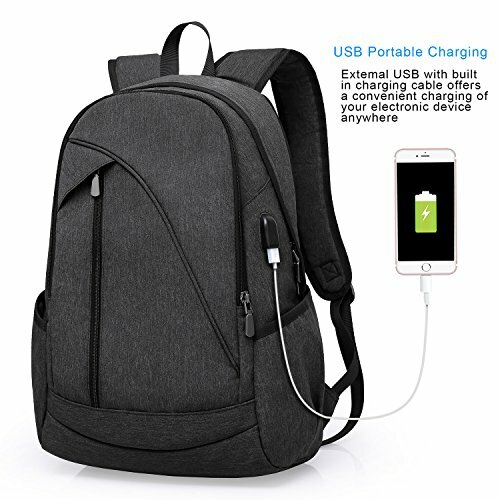 This is convenient as well as safe as you can lock the zips but still quickly charge your phone without opening the backpack. Inside is a pocket where you can put your power bank. So you can stay fully charged and ready to go anywhere. The elegant design makes it a top quality backpack for women. Because it’s a water-resistant laptop backpack it’s also the perfect gift for the discerning businesswoman or traveller. Let’s run away together! It’s water-resistant so if it rains or if you spill some liquid on it, your stuff will still be dry. Protects any electronics from light rain & space for a power bank to charge them up. Has durable zips and good quality straps with a well-padded backstrap. Lots of assorted pockets & spaces to store a variety of things. The mid-sized chic design makes it a perfect backpack for women (but it’s great for men too).